Star-Lord and crew fly through space during "Guardians of the Galaxy Vol. 2" (2017). 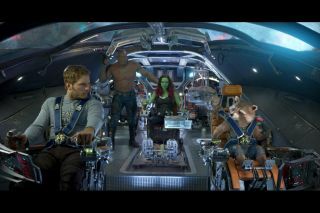 In Marvel's first "Guardians of the Galaxy" film (2014), Chris Pratt's Star-Lord character manages to survive exposure to space without a spacesuit. But he's a special case — and in the second film, out last week (May 5), other characters don't fare nearly as well. Science fiction is full of characters being "spaced," or jettisoned out of a spaceship without any protection and with little hope of rescue. But what would actually happen if a human ended up in space without a suit? "It's also true that due to the low pressure outside of the body … bubbles would form throughout the bloodstream and in tissues, but the most immediate problem would be lack of oxygen and unconsciousness," he told Space.com in an email. Buckey is the author of "Space Physiology" (Oxford University Press, 2006), which discusses how to keep humans healthy while on space missions. Buckey told Scientific American that people could likely survive a vacuum for a few minutes, based on data gleaned from accidents and animal research. They could even survive long enough to be rescued, if they weren't thrown out intentionally. But it wouldn't be pleasant, he said. Paul Sutter, an astrophysicist at The Ohio State University and a Space.com columnist, detailed three main risks of the big empty, each of which would affect your body at different rates as time ticked on: the vacuum, the cold and the lack of oxygen. The vacuum wouldn't make you explode as some sci-fi works have imagined — your skin would prevent that — but it would cause nitrogen dissolved in your bloodstream to bubble out, Sutter said. That would lead you to puff out to about twice your size, he said. The incredible cold of space would eventually chill you, but it would take a long time, Sutter said; because there's no substance in the vacuum to pull away your heat by conduction or convection, you would lose heat only as it slowly radiated from your body. Conduction is the process of losing heat by contact with something cold, like an icy pavement, while convection is when a moving fluid or gas, like water or blowing wind, cools your body by carrying away excess heat. Neither are found in the vastness of empty space. So, ultimately, the effect that would be most deadly most quickly is indeed the lack of oxygen. You would lose consciousness after about 15 seconds, Sutter said. If rescued within a minute or 2 you might be OK, albeit inflated by your bubbling blood, suffering from frozen skin and enjoying a harsh sunburn from UV radiation, he said. After 2 minutes, however, the rest of your organs would also have shut down from lack of oxygen, and you would be a goner, Sutter added. Rather than relying on the faint chance of rescue within that time frame, it might be best to avoid the space accident, mutiny, desperate escape or heroic sacrifice that leads you to the excursion in the first place.